My daughter was eating a snack, and I asked her to clean up after herself. She went into the kitchen, but didn’t throw away a paper towel that had a dab of applesauce on it. Instead, she brought it back to me, clearly wanting me to dispose of it personally. Someone in the knitting community posted a link to a Diesel Sweeties comic. I read Diesel Sweeties intermittently, so I’m glad someone pointed it out. High-larious, at least to me! It was a lot easier to do night owl Dragonrealms work until 1am when I didn’t have a child jumping on my bed every morning promptly at 6am. On the up side, I’ve gotten my Dragonrealms inbox down from 92 e-mails to 52. I’m getting caught up again, just very slowly. Zero DR or knitting content, high fat content. Some folks asked for this recipe, so here it is. I can’t claim this is healthy, but it’s easy as can be. If you’ve got fresh summer berries in season, MAN is this good. * Preheat oven to 350 degrees F. Once oven is preheated, melt butter in a 9×13 inch baking pan. * In a medium bowl, stir together flour, sugar, and milk. Batter will be slightly lumpy. Pour mixture on top of melted butter in baking pan. Do not mix butter and mixture together. * Drop blackberries into batter. If more crust is desired, add fewer blackberries. Bake in preheated oven for 50 minutes or until golden brown. Okay, I think the contest, she eez about ready to be born. I welcome any comments, questions, criticisms, etc., especially from the knitters in the group. I have a rhino-thick hide, and I’d rather make changes early than late! Please consider going clicky-click and telling me what you think! Read entry 3, then read entry 5. With good intentions but misunderstood motives, you are a hardy, if somewhat unreliable, companion. 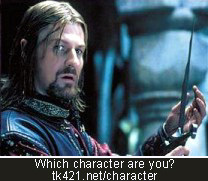 Boromir is a character in the Middle-Earth universe. TheOneRing.net has his character profile. So basically, I seem okay, but let your guard down and next thing you know you’re being spirited away by orcs. A while back, Sars at Tomato Nation did a contest in which she asked her readers to donate to Donors Choose in exchange for a feeling of well being… and goodies, too. I thought it was a great idea. I contacted her a few weeks ago to ask her for tips, and she was very helpful. a) donate and you are entered, no minimum required. b) every donation of $10 or more enters you again, like purchasing raffle tickets. I could be beholden to people’s honesty, as I can’t recall offhand whether the e-mail they receive mentions the amount. However, I am a trusting person. c) (and Sars recommends against this one because it’s a bookkeeping headache), go with a) and also let people without credit cards PayPal me and I forward the cash to Donors Choose. I dunno. I want Donors Choose to get the most money, but there’s really something to be said for “keep it simple, stupid.” I’m mulling it over. Thoughts on the process? If you’re a knitter, thoughts on what you might like to get? I’m assuming most people will do it because it’s a fun thing to do, and a nice way to help people – but let’s face it, swag never hurts. The next challenge: write the challenge up in a very short way, because nobody wants to wade through a hella long post. …and then the cat craps on the pattern. Stupid cat. I should take that stupid hat away from you.